The time is approaching to seed onions. Last year we started our onions on March 1st and they were about the right size when we were able to get them into the garden. Any time from mid to the end of February is fine for starting in this area. You just want them large enough to transplant to the garden when the nights have quit freezing. 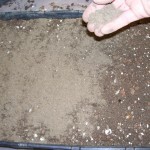 I will assume that you have been cooking your dirt and have it ready to mix together with the Perlite and the Peat Moss. 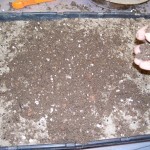 The mixture that I use for seeding Onions is about 3 parts cooked, sandy dirt to one part Perlite and one part Peat Moss. The Onion seed prefers a sandier soil than some of the other seeds. 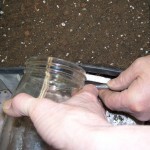 After I mix the dirt I fill a flat with the mixture almost to the top and level it out with a firm pressure so that the soil is not too light. 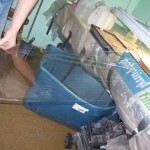 The flats we use are double with a layer of plastic between so that we can water the seeds in the end of the tray between the two flats. 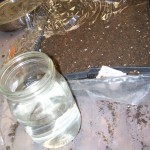 We do not want to flood the seeds and so they are actually watered from the bottom as they wick up the water. So as I said I just level the dirt with the palm of my hand and firm it down until it is as flat as I can get it. 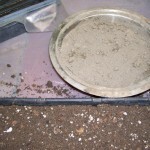 Then I sprinkle a light layer of cooked, white sand on the dirt. This is so that I can see the seed that I sprinkle on. Onion seed is black. We use 1/2 tea. 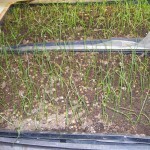 of onion seed to each flat, which is 250 seed. If you heap it up a little it will be 300 which is a little too much seed for a flat; the onion starts will not get as large as you would like them to be for transplanting. 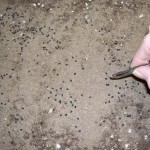 After I sprinkle on the seed I work with a pair of tweezers and evenly distribute the seeds around the flat so that each seed can grow into a 1/4 inch diameter plant. 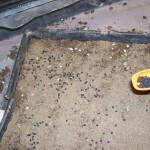 If the seeds are too close together they will stay 1/8 inch or less and usually die when they are transplanted. 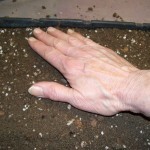 Sprinkle the seed with another 1/4″ of soil and firm down with palm of hand. Be sure and label each tray as you finish it. I cut a piece of blind and mark on it with a permanent marker. Pour 1/2 quart of plain water, not fertilized into the end of the tray between the two layers and let it soak up from the bottom. Do not disturb the seeded area of the dirt. 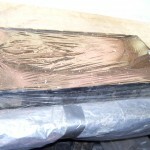 Cover with a long piece of saran wrap. The saran wrap in the large rolls from Costco are great for this. They are wider and can be tucked under each end and still cover the sides. I use about a 3 1/2 foot length for each tray. I leave the flats on the heat table for a few days until I need the table for the next planting of seed. 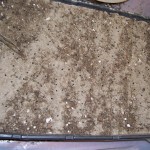 Onions do not mind being cold and will sprout and grow nicely in a colder area of your seeding room. This entry was posted in Planting. Sue Anderson is a participant in the Amazon Services LLC Associates Program, an affiliate advertising program designed to provide a means for sites to earn advertising fees by advertising and linking to Amazon.com.